Good morning. Welcome to this wonderful day! I will share with you that this is the favorite day of all of us who work with our students at the Pardee RAND Graduate School. It is on this day that we are able to celebrate the achievement of our new graduates. And it is also on this day that we are able to welcome back their predecessors, our alumni. Welcome to each of you who have joined us on this day of celebration and recognition, this commencement. 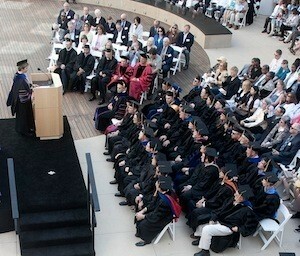 Many of you have made this day possible for our graduating students. You’ve provided love, support, and encouragement; whether through teaching, mentoring, project work, a cup of coffee during dissertation writing, a beer after qualifying exams, taking care of the kids, or just being there when the demands of the program seemed too much – you are the community that each of our students has needed to succeed. Thank you. I would like to specifically recognize a few of our guests. Two of our previous deans joined us in the procession – Bob Klitgaard and Charles Wolf. We have four of RAND’s presidents with us today: Harry Rowen, who was President when the school was founded; Don Rice, who worked with Charles to establish the school; our long-time supporter, Jim Thomson; and, of course, Michael Rich who will soon join us on the stage. Alumnus Mark Albrecht is here. Last night Mark received our first Alumni Leadership Award. Congratulations, Mark. I should point out that Fred Pardee has joined us today, thank you. I’d also like to recognize our many supporters sitting amongst you, friends of the Pardee RAND Graduate School who make this exceptional program possible through scholarships, dissertations, faculty fellowships, and more. Finally, particular recognition goes to the members of our Board of Governors who have joined us for this weekend including our chairman Joe Greer. We are here today for Commencement. Even while we appropriately take the time to recognize our graduates’ achievement of the academy’s highest credential – the degree of doctor of philosophy – we understand that Commencement is about beginning. It is about what lies ahead and the promise within each of our graduates. We might even say that today is one more step in what journalist Robert Kaplan calls, “the ungainly process of becoming.” Of becoming who you can be, of becoming who you want to be. Graduates, grounded in the commitment to service each of you made upon deciding to enter this program and strengthened by the integrity and courage each of you has within, this process of becoming will include good moves, false starts, a few detours, and many more victories. But as you move forward, you will become the thinkers, the actors, the leaders of the changes we know must be made in our nation and the world. We applaud your successful completion of this extraordinarily difficult program. We are excited by what you are now bringing to the world. We share the belief that the world can be a better place and you, our graduates, are essential to making it so. Anticipating this wonderful day, I’ve been thinking about what our graduates take away from their time at the school and at RAND. Although first year problem sets might lead one to think otherwise, the point of the Pardee RAND Graduate School is not to simply teach repeatable skills that allow our students to be competent policy analysts. The intent of this school is to help you determine what constitutes true excellence. The point of our program is to complement the heart and passion and intelligence you bring to the school, to provide you with a set of tools and experience that reaches beyond academics to the real world with its very real problems. What we teach is not the end point. It is a resource you draw upon as you develop an understanding, start the unraveling, and begin taking on the insecurity, instability, and inequity of the world we live in. And it is into this world that I urge you to plunge. The questions you ask, the problems you take on must not be defined by the agenda of peer-reviewed journals. Despite the strong incentives to do so, don’t give into the marginalism and self-reproduction often encouraged by academia, the government, or the research organizations you might join. As our friend and scholar James Q. Wilson regularly reminded us, the questions we ask should not come from within academia or be driven by available datasets. The questions we ask, the problems we pursue, must come from our concerns and what we see and hear as citizens. Look around you, live in this world, and find those things that matter to you, to your community, and to the people who are doing the work, living their lives, and feeling the effects of governance and policy. And then use the analytic tools you have and the evidence you gather to identify what matters. When this knowledge is combined with your heart, you will be the answer to the challenges in our communities and the world. Start here, today, and look around you to see the examples set by our alumni and your fellow graduates. You will see among you those who have already been tackling the problems that matter to people. You and those who came before are working in school districts to improve the education of our children, helping to rebuild and protect the Louisiana coastline, taking on food insecurity, getting to the bottom of drug addiction, developing new ideas for reducing greenhouse gasses, and helping to build better worlds in Africa. These are your friends, colleagues, and classmates, who are working to solve, or at least handle, the problems that matter to the humans who make up our world. I will close by congratulating you for all you have accomplished – so far. The entire Pardee RAND Graduate School community, as represented by those in attendance on this glorious day, eagerly waits to see the difference you will be making. That will be your measure and the measure of this school. Enjoy this day and thanks to each of you.